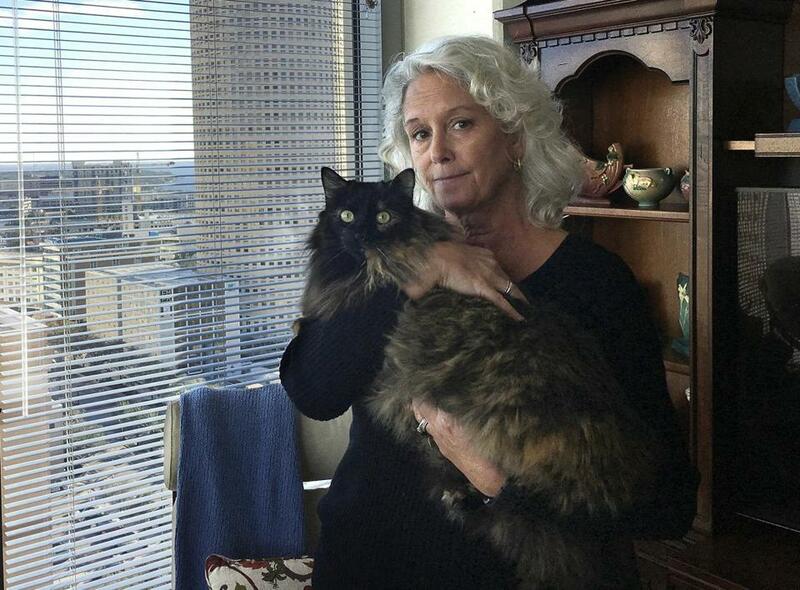 Christine Lee held her long-haired house cat, Calli, in her condominium in downtown Tampa, Fla.
TAMPA, Fla. (AP) — A Florida contractor says he was attacked by a bobcat inside a woman’s condo, but the animal’s owner says her feline is no predator, just a 10-pound domestic longhair kitty named Calli. The contractor, Marcos Hernandez, filed a lawsuit in Tampa on Dec. 19, alleging condo owner Christine Lee illegally kept a bobcat inside her unit. Hernandez says a bobcat scratched him on May 16, causing him serious injuries after he entered the condo to conduct a fire safety inspection. Lee wasn’t there at the time. She says she has never owned a bobcat, just Calli and a sleeker black cat named Max. Hernandez’ suit also names the condominium building’s owner. The lawsuit was first reported by the Tampa Bay Times, which took a photo of Lee and her cat.